Understanding the role of the aura in our physical and emotional health is just as important as understanding how the foods we eat influence our physical system. Nonetheless many people mistakingly believe that understanding the aura is only for crazy hippies and new age weirdos. I'm not advocating that you become a Reiki master and start doing energy cleanses on your friends, but rather developing a working understanding of what the aura is, and how if influences you on multiple levels. Those that can see the human aura often describe it as an egg like energetic dome that surrounds the body approximately 2-3 feet away from the physical body. The aura tends to change colors slightly throughout the day depending on mood or environment, however people will have a dominant color in their aura that reflects the person's relative level of consciousness or spiritual functioning (which can change slightly throughout a lifetime), this is what people are sensing when they pick up a "vibe". This "vibe" is like the soul's calling card and can be thought of like a personality style, but without the ego. Most people have a few basic aura colors, which can shift depending on emotion. Positive emotions and healthy functioning tend to create pure, bright and vibrant colors; whereas negative, stuck or repressed emotions tend to produce dark, muted or muddled colors. Colors span the light spectrum from deep orange to violet or even white (although this is typically only in highly evolved or realized people). A healthy aura should be clear of ruddy spots, shapes, or discolorations and not have any rips, tears or holes. Those who are ill or could potentially become ill may have various foreign thought forms or other energetic debris stuck in their aura. As the negative thought form or energetic impurity works its way from the outside to the inside of the aura closer to the body, the person may begin to feel increasingly more sick. You can feel the aura around a person's energetic space if you develop sensitivity in your hands. Try rubbing your hands together and closing your eyes and feeling around the space of a friend or partner. They may look at you a little cockeyed if you don't ask first though, so don't be that weirdo. You should feel or sense a sort of energetic wall around the person, even if it's slight, you may even start to pick up on their emotional state or thought patterns if you're particularly sensitive to energy. Your hands may tingle or get warmer or cooler as you "tune in" to their aura. Play with it and see what happens. Auras expand and retract throughout the day as a reaction to what the environment or people in the environment are sending out. For example, if you are around those you are comfortable with your aura will be a bit larger because you feel more comfortable sending out your energy. However, if you are in a hostile or unfamiliar surrounding you may contract your aura as a form of protection. Similarly if you are tired your aura will contract and become muted or muddy, but if you are rested it should be relatively vibrant and expansive (provided you rested well). Some people's auras are more sensitive and susceptible to influence from outside energies, whereas other people tend to have less sensitive auras. As a general rule the higher on the light spectrum someone's auric emanation is (blues, purples, and greens) the more sensitive they will tend to be, although there are exceptions to this. This is because the color frequencies have a harder time absorbing and integrating other energy frequencies and become contaminated more quickly. 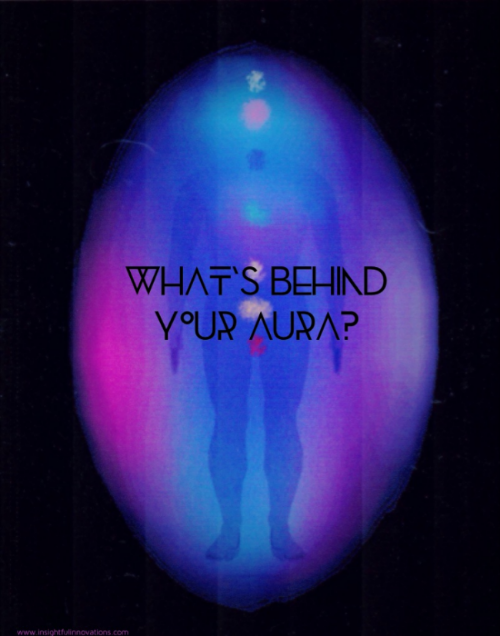 You can protect the aura through shielding yourself mentally. Since your aura is very heavily influenced by your predominant emotional or mental state, changing or influencing your own thoughts will in turn influence your aura. Thinking about wrapping yourself in a heavy robe or imagining wearing thick armor will in essence help to protect your aura from potentially foreign influences because you've built a thought form. The aura is nothing but thought energy created by your consciousness. Everything in the universe is just energy, or thought projected by something. When we interact with another person we are not only interacting with them through our verbal and nonverbal exchanges but also energetically. For example, when two people are "connecting" in a romantic way, one or both people typically send out energetic streamers from one of their lower chakras (typically the 1st or 2nd chakra) to the other person's chakra and auric system. This "streamer" tells the other person's energy system they are interested and typically carries all kinds of thoughts associated with romantic expectations, desires, fantasies and fears. Conversely when we are in conflict we may either expand our aura into the other persons space to become more intimidating, or retract our auras very close to our body to feel less vulnerable. Our energetic character structure (or the characteristic way we manage our energy in the world) will dictate much of this behavior, but it's all done through the aura and chakras. There are various energetic mites in the environment and around some people which can nibble at our auric field causing everything from minor fatigue and irritation to chronic illness or even death. Those who are sensitive and aware can often feel an energetic attack, but most people will be unaware of energy pirates and the effect they have on the energy body. People with a particularly negative energetic charge will begin to vibrate at a lower frequency and as such attract lower vibration thought forms, people or entities into their auric field. These people, thoughts or entities can feed on the persons energetic system for some time until hopping onto someone else with a similar frequency looking for more "food". The wheel of life extends even to the energetic world, and even negativity has to feed on something, just don't let it be you! How you ask? Don't worry, we got you. In our next post we will offer some tips for how to cleanse and manage the energy system to help keep these energetic pests out of your proverbial energetic hair. We will also give a brief description of the predominant "vibe" of the major aura colors.